Condor Ferries serves throughout the year the Channel Islands, from France and England. 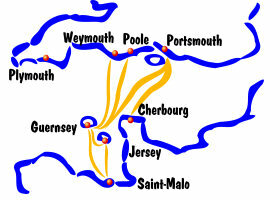 Connected ports are St. Malo and Cherbourg in France, and Poole, Weymouth and Portsmouth in England. All these links are provided by fast ferries.